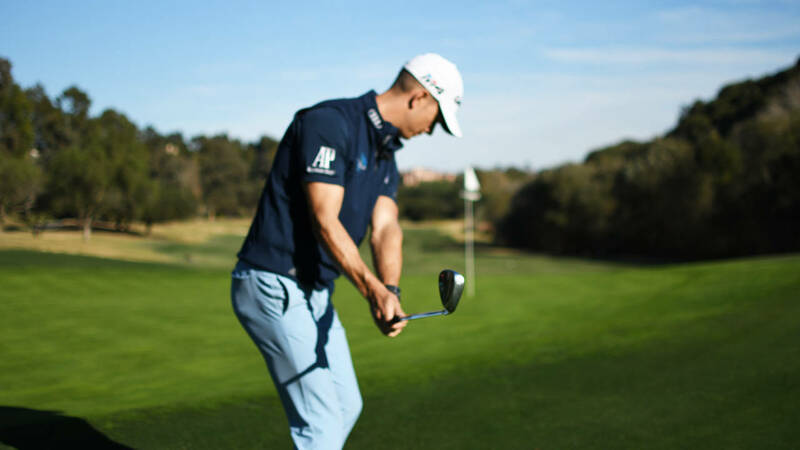 Improve your chipping onto a downhill lie by using loft. Enormous thanks, guys. Your instruction is accessible and easy-to-digest without the unrealistic claims found elsewhere. I just broke 80 for the first... time ( 2 times this week!! ) due in no small part to you. enjoy your lessons and your course vlogs. keep it up. I joined meandmygolf just under a month ago, after I saw the free videos on YouTube. I liked the way Piers & Andy explained the concepts, and sign... ed up for the free 30-days. I've played one year previously (2008), before I went to university, and had to drop this expensive hobby. I started playing golf again this summer, and was playing somewhere around 95-110 shots. I wanted to get better fast, and started the Break100-plan to get under 100 constently. I went through the plan a bit quicker, 2 weeks of the plan in one week, and just after I finished the last week, I pulled an amazing score of 84!!! That is absolutely insane. Something just clicked. If you want to build your game back up, or just go back to the basics, don't skip the drills. They may sound tedious and lame, but they actually help. Stick with the plan, and I guarantee it will work! Can't wait for the Break90 plan! Awesome job Piers & Andy! I learned to play golf at a very young age and at my best I was around a 12 handicap. After college I started to play golf more frequently again and w... as struggling the past two years to get under a 14 handicap. Thanks to Andy and Piers I am down to an 11in the past month and trending down. It had been years since I revisited the basics (i.e. chip vs. pitch, how one should address the ball, finishing your swing). It is because of this I have been able to shave strokes off my game. Whether you are a 24 or a 4 there is something Me and My Golf can teach you! I missed a 15 foot birdie the other day to break 80 for the first time ever! With their help, I hope to accomplish that goal before the snow sets in. Huge Thank You to you guys! First time I’ve ever broken 90 (I’ usually on the upper 90s, low 100s), and it’s because of the awesome videos and t... ips - I just started this week and have been on the range practicing the drills. Then boom, the next time I played I broke 90. So Thanks again! :) More power to you guys! I feel bad for my golf instructor! After finding out about the guys at "me and my golf", i've learned more watching their videos than I ever could hav... e with an instructor. 30 minute sessions compared to constant videos at my leisure have given me more time to learn and practice my swings. You guys truly provide easy to understand lessons for golfers at any level. Thank you so much, you guys are a blessing for the golfing community! These two are officially my favorite golfers in the world! Never before have I seen such detailed yet comprehensive instruction. I've taken lessons wi... th several local pros, but nothing they'd shown me compared to the knowledge and instruction I've been given by Piers and Andy. The information is given in an easily digestible and light hearted manner, making it very easy to retain and focus on. My brother makes fun of me for watching too many videos, but the change in my game has proven its value. A month of viewing and practice brought me from a 105-115 average to five rounds in a row averaging 95! This made me a true believer in their understanding of the game, so I recently committed to the official site. The site is so helpful and easy to navigate. The subdivided sections that focus on specific issues and the ability to create your own playlist make this site a useful tool for players of all skill levels. I continue to learn from these videos and am continuing to improve. Aiming for the 80s next season. Thank you so much, gentlemen. You've made such a difference in this golfer's game, so please keep it up! Hands down you both are providing the best techniques to master the mechanics of the golf swing. It feels Hogan, but modified for modern equipment due... to technology. Efficient, repeatable, powerful. It's just physics. Thanks for playing Taylormade! I love your site. Your instruction is just fantastic. The combination of video with explanation and correction drills is superb. I am a single digit h... andicapper who basically knows my swing and its faults. Your videos have really helped my ball striking and short game. You guys are such good teachers. You teach directly and plainly without all the nonsense, plus you both have beautiful swings which helps a visual learner like me to emulate. I am so glad that I joined. Your site is very well organized and easy to navigate. I love the fact that I can create my own categories and save videos to refer back to later. I am so glad that I found this. Thanks a bunch! These guys and their videos are awesome. Really helped me out of a funk and got me back on track! Start with the grip video, go to ball position, address your posture, get the timing down, and then watch your score go down. Just that easy! These gu... ys are great! Thanks for giving me something to do and learn while deployed in the military. Can't wait to apply what I have learned to courses all around the world... .
We at Team Powell have been watching the videos and instructions of these for guys for some while and can honestly say they are the best for no nonsen... se easy to understand golf instruction. There tips have helped us reduce our handicaps and we have now won 3 monthly medals in a row which is fantastic. There website is easy to use and packed with loads of stuff to help your game, so don't delay get signed up today and as the guys say "take charge of your game". As a high handicapper I often get confused by some of the more technical and not so relevant teaching out there, but not so with meandmygolf. Excellen... t practical tips delivered clearly and easy to understand. Already helped me to improve and certainly understand what I'm doing wrong. I have recently joined, but I have been watching the videos for a few months now and they really have made an impact on my game. The level of instruct... ion given in such short videos is the perfect combination. I have learned a lot from the website and videos and I do feel that I am taking charge of my game. Thanks for your videos and instruction. I have followed meandmygolf for some time. Andy and Piers have a great approach to the game. Their videos are simple to understand and well presented.... Their approach focuses on the whole game and having a tailored plan for each golfer makes so much sense. They always make an effort to reply to the many questions they get asked. Thanks so much. Keep up all your good work and look forward to seeing more great videos! Meandmygolf.com is not only a complete book of concepts and drills properly organized and explained in a highly didactic way. It is also a demonstrati... on that golf knowledge can be spread in a friendly and funny manner. There is no doubt that watching the videos from Piers and Andy golfers of any level will shoot better scores very soon. I decreased my handicap from 11 to 7 in only 6 months! As with many instructional videos they can leave you puzzled and sometimes frustrated, but you guys at Meandmygolf are thourugh and your videos are br... illiantly illustrated, I know your drills and methods have helped my game in abundance looking forward to you and your team getting me to single figures this year. I started to play golf more seriously over the last couple of years. I needed to look at my swing and how to be more consistent. I viewed a lot of on-... line coaching videos, but nothing seemed to connect with me until I came across “Meandmygolf”. Both Piers and Andy seems to explain the fundamentals in a way I understand. All the help and practice has taken me from a 24 handicap to a 16, and I am looking to get down to single figures this year with the help of Meandmygolf #takecharge. Thanks to Me and My Golf.com I've been able to improve my long and short game. I've scouted over the internet, and haven´t found a better source of t... ips and drills. It's amazing the way Piers and Andy make it easy to understand, therefore, easy to apply. Thanks again guys for such amazing job and help, you give me everyday. Excellent, easy to follow advice that has helped all aspects of my golf game tremendously! I was a bit skeptical about spending $10 or so a month on two blokes telling me how to swing a golf club on the net, how wrong was I. I just wanted to... say a massive thank you to you both, my game has improved so much in the 4 months that I've been a member and now all I want to do is play or hit balls at the range. Also, Andy did a little segment on chipping from the rough and coming down onto the ball.....well anyway I had a shot like that and I thought to myself what did the boys tell me to do. I was literally 5cm away from the water in sand with little back swing, so I've come down on to the ball and I got out (it didn't go far, but I got out) with out dropping a shot, so again thank you so so much for your great videos, loving every one of them. Cheers! Excellent. Glued to it. Dropped three shots in 4 weeks due to previous videos, hopefully something similar will happen because of this website! I hadn't played golf in almost 20 years. But started playing again when my oldest daughter started playing on the high school golf team (she just lite... rally started playing golf in April of 2017 when she joined the team). So I was looking for help to get my game back in form, so I could practice with her. I watched a bunch of videos on youtube and even joined some sites, including this one. But Me and My Golf has been the easiest for me to follow, with simple to duplicate drills, and no super long winded mumbo jumbo in between. Plus, they show they like to have a little fun and that's what golf should be about. It has really helped me with my game and I keep improving. Thanks Andy and Piers! I am still recently new to golf (8-21-2017) is only my 3rd year of golfing more than 3 times a year. I have been following Me and my golf first on you... tube, then for the last year as a member. Knowing my swing faults, and being able to have them, through their videos, show me drills to fix them has helped me improve my game and enjoyment level of golf even more. I highly recommend this site to anyone, whether beginner or not if you want to improve you golf game. Love your stuff guys. I’ve learned more this summer with your videos than the last 3 years with my old swing coach. Biggest telling point, dropped a... lmost 5 strokes off my score. Huge! Thanks!!! Love this website! I have only been golfing for a few months and I have looked at several other websites and programs before this one, and meandmygolf... was easily the most comprehensive and helpful resource I have found. I went from barely getting the ball in the air to quickly hitting quality golf shots fairly consistently. Thanks to your website, I already feel like a pretty educated golfer. Can't wait to watch more and continue to improve. Thanks guys! Awesome. These guys have been YouTube/Instagram favorites for some time, so expanding my access to their knowledge was a easy call. Their knowledge of... golf is simply brilliant, and their personalities are great learning platforms. Wether you're also working with an in-person pro, someone balling on a budget (it's a great value), or even the 8 handicap looking to get scratch, it's with it! Top content really helped me with my game! Great prizes to motivate on improving to lower your score!! Plus the videos are high quality. You can tell it took a lot of work and effort making eac... h videos. Amazing job team. From IG to YouTube to the website? Your resource and tools to help Golfers around the world are greatly appreciated, 👍🏽👌🏽 Thanks for your hard work! I've been playing golf my whole life. I've always hit a high, short, slice. I also typically hit everything fat. I joined Me and My Golf several month... s ago and began watching the videos on striking the ball pure. It was a light bulb moment for me. The golf swing finally made sense. After working through the drills, my game has totally changed. I'm hitting a draw. I'm making solid contact, and I've added about 45 yards to my five iron. I can't say thank you enough. Seriously one of the best golf platforms I've ever seen. Love the member portal and how easy it is to find videos that you need help on. NICE WORK GUY... S! Should you Hover the Driver?